The Cooke Insurance Agency, LLC serves all people in insurance matters, in the most professional manner, with honesty and integrity. 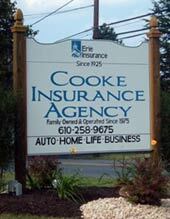 Cooke Insurance Agency is an independent agency, representing several insurance companies. Our team of licensed agents specialize in the sales and service of auto, home, business and life insurance products in Pennsylvania. 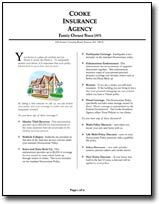 Founded in 1975 by John S. Cooke, we continue as a family-owned and operated insurance agency. Our Agency is committed to putting our customers "first". We pride ourselves in being able to provide personal and friendly service to the families and businesses in the area. We provide you with quality customer service, periodic reviews of your insurance coverage's and premiums, and assistance with reporting claims. We are here for all your insurance needs.